Would You Rather Be Busy or Bored? Exploring the space between stress and stalemate. People love to say they are busy. Often, it is a self-inflicted state. We do it to ourselves, to make us feel superior, more important, or more in-demand than others. In reality, most of us are not that important at all. So why do we do it? Do we really need to cancel on friends and family, or sacrifice eating or sleeping to finish ‘work’ or attend ‘events’? Or, are you simply packing your schedule to the breaking point so you can ricochet between these appointments only to breathlessly declare how busy you are. You’re not fooling me. I have been busy before. The kind of busy where you say yes to everything even though you should not. It doesn’t always feel good, being at the mercy of the schedules of other people. What is productive or positive about losing sleep, or skipping healthy meals, or missing workouts, or rain checking quality time with friends, family, or yourself? Nothing is worth it. There are few things that stress me out more than looking at my agenda on Monday, and seeing something booked for every night of the week. That sends a signal to my brain that this is going to be a stressful week. That there will be no downtime, that I’m going to be doing a lot of traveling, and that I’ll have to be “on”, so to say. It means there won’t be time for family meals, or my favourite classes at Goodlife, or even just some time to finish my current book. And there will be feelings of begrudging anger because I did it to myself, by booking things in advance and taking up all my free time. I have really made a conscious effort over the past few years to plan ahead so I can carve out my own free time. Days where I don’t schedule anything. Where I can either get all my chores finished, or do all the things I couldn’t do during the week, or just to do nothing at all. My motto is “Saying no to others is saying yes to yourself” and I try to push it on to all the people who I hear complaining that they are simply swamped this week, that this month has been crazy, and their weekend is going to be hectic. It’s as easy as planning ahead, allotting time for yourself to do the things you love and the things you want to do, or to simply do nothing at all. The choice is yours. Now, sometimes it’s not always this easy. And sometimes things pop up unexpectedly and are unavoidable. But if you’re cultivating a habit where you make it a priority to schedule time for yourself, it will not be as draining when those truly busy weeks pop up, and you will appreciate your downtime even more. On the opposite end of the spectrum, I have also languished in the drudge. I have quite literally been bored to tears in those mind-numbing, soul-crushing positions where there is nothing to do but count the seconds as they tick away slowly. Is there anything worse than waste? Waste of your time, your talents, or your skills? 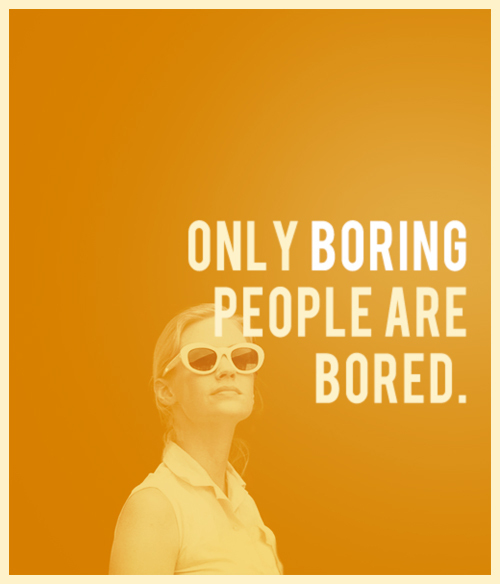 “Only boring people are bored.” One of my favourite Betty Draper quotes, but I disagree with her. I align closer to Laurie Helgo who said, “I am rarely bored alone; I am often bored in groups.” Just because I prefer a lifestyle that may appear boring from the outside, it does not mean I am a boring person on the inside. I see these as two separate issues. Just as a boring person can have a very full schedule, periods of rest can be either active or passive depending on the person. You can waste your time, or, you can cherish it by reading, writing, learning, or just existing. It is the sweet spot of being alone, but not feeling lonely. My advice would be to start small. If you are in the habit of always saying yes to others at the expense of yourself, start by giving yourself permission to say no. That, in and of itself, is a huge step. As you begin to feel comfortable with that, start by picking a few nights each week where you schedule time for yourself. Pick one weeknight, and one full day on the weekend. Say Wednesday night, and Sunday during the day. If your friends want to go for dinner this week, any day but Wednesday is fine. If someone wants to grab a coffee this weekend, you can only do Saturday during the day. Stand up for yourself and put your foot down. Remember, each time you say no to someone, you are saying yes to yourself. It will take time before this starts to feel natural for you, but once it does you won’t look back! Welcome to your newfound freedom! 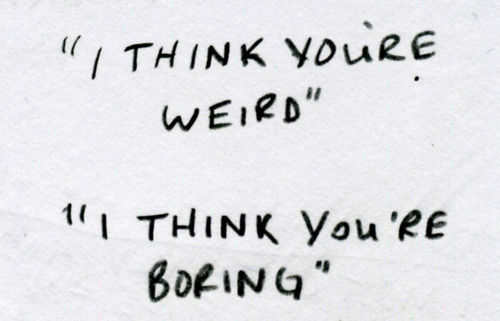 Full Disclosure: If we’ve ever spoken, I’ve written about you in my journal. I finished another journal. A pretty thing, embossed with Tudor Roses and gilt pages, purchased from a museum gift shop in Washington. 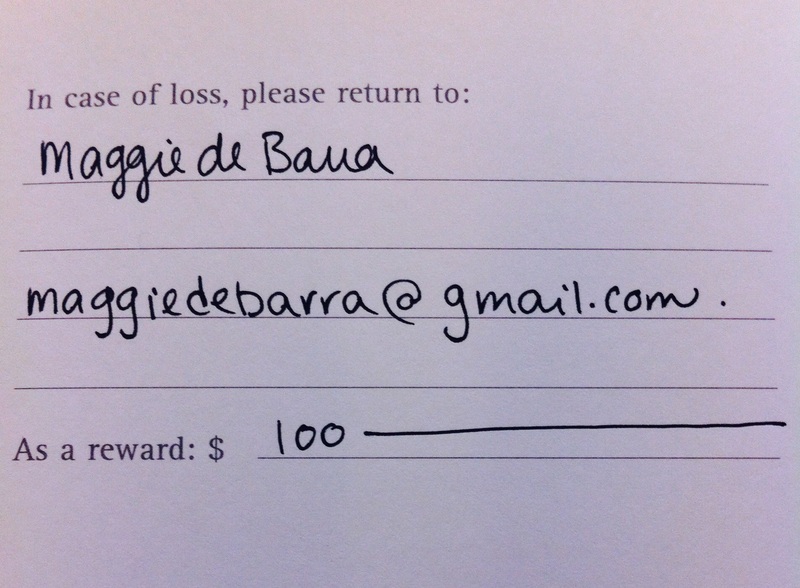 It was bigger than what I’m used to, but it fit in my purse and was mostly discreet at coffee shops. I had purchased the successor a few weeks ago. I like to keep the spare around in case I fall into a spell and run though the last pages faster than anticipated. Is there anything worse than having a mind raging with things to write and no journal nearby? Or maybe having a notebook, but no good pens? I have found that buying a new journal before the old one is finished is a bit like declaring the heir before the reigning monarch has died. Your hopes and dreams turn to the novelty. In the past, I’ve found myself wasting pages full of nonsense just so I can move onto the next. I have been keeping a journal since December 21, 2001. Nearly 13 years! Almost half of my life!! Save for a few months here and there, I have mostly recorded every day of those 13 years in one way or another. Journaling is a tool that I use to achieve all the “selfs” I was talking about. I keep a diligent agenda, the Moleskin Weekly Notebook has been my favourite for the past 6 years or so, where I keep a detailed record of the day-to-day goings on: my work hours, funny things that happen throughout the day, what I make for dinner, noting mood extremes either happy or sad, time spent with friends and family, and my gym schedule. Basically, all the facts. This may seem excessive to some, but I’ve been doing it for so long it is just a part of who I am: constantly taking notes, making plans, scheduling ahead. If I don’t get through my thoughts as I write in my journal during the day, once a week or so, usually on Sunday, I’ll pull out my agenda and transfer in the details of the week with expanded thoughts or comments. I had taken to calling it my double journal system- the agenda and journal working in tandem. Using these two books, I can basically track every day of the last 5-6 years in great detail. I have a big box stuffed with my old journals. Too many to count now. This box would be the first thing I grab in a fire. It is my life’s work, my legacy, and my greatest accomplishment, thus far. Self-indulgent and narcissistic, maybe. Therapeutic, calming, and essential for good spirits, definitely. This is how I keep track of my feelings, loves, dreams, fears, big thoughts, and plans. It is one of my dearest friends. Within those pages I can be honest about everything I’m thinking and feeling. I don’t hold anything back. I have thoughts and feelings for a reason, and I think it would be a disservice to suppress them, so I explore them fully. Logistically, the best time for me to write is at lunch. With a coffee, and a good pen, sometimes earplugs, I can get about 30 minutes in during the day. Sometimes over the weekend I’ll have a marathon session and hammer out pages for hours. Sometimes I’ll take breaks… circling back to tackle an issue or a tricky problem. If I don’t write for a few days, and I have my agenda building up a list of bullet points to address, I get stressed. I imagine it’s like being an addict, I actually crave writing in my journal. Sometimes, when I purposely avoid writing, it’s because I have an issue that I’m trying to avoid. I don’t want to write because I know I’ll have to confront it. Those are usually the times when I need to write the most. My greatest wish would be to one day publish these journals. I see the paradox here. While, yes, I am writing for myself, I do write with the understanding that one day these may be read by others. Millions of others? Perhaps. When Anne Frank heard on the radio that journals and letters were being collected for the historical record, she began to edit her work and started to revise for the purpose of publishing. She was writing on a small-scale, but with the bigger picture in mind. While I would love it if the things I wrote entertained or inspired people, I don’t know if anyone but myself would find it relevant or worthwhile. I’m sure it will need to be many years from now to soften the blow to my friends and family. FULL DISCLOSURE: If we’ve ever spoken, I’ve written about you in my journal. Some more than others. I do have more to say on my favourite topic, but with this, I’ll let you go. Wishing you many happy hours of self-exploration and insight through journal writing. Remember, the unexamined life is not worth living! 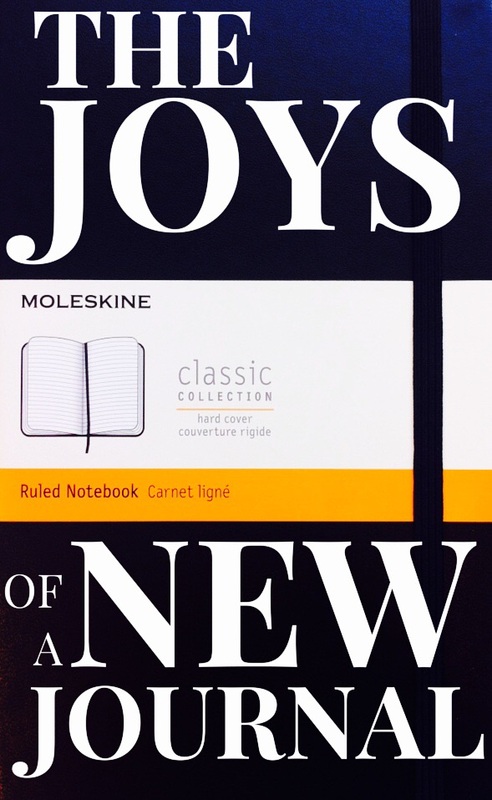 The Joys of a New Journal first appeared on Paper Clips by Maggie de Barra.